The 2004 Honda CRF50 Street Legal Dirt Bike for Sale has had many many upgrades like a rev box, a Baja Designs light kit, a BBR handlebar kit, One Industries seat, shocks, pro footpegs, DOT tires and so much more. The fully street legal dirt bike for sale runs perfectly and is very comfortable for an adult to ride but not too tall for kids. 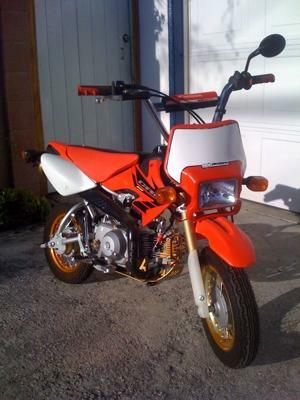 This 2004 Honda CRF50 is fully licensed, street legal and OHV legal. It's a very interesting motorcycle to own and is a fantastic conversation piece. It's easy to haul which makes it good for camping, competitions, Laguna Seca and anywhere you want a fun pit bike to ride. If you're interested in buying the used dirt bike or need more details you may or leave your questions and contact information in the space below provided by Strike Lightning and the owner, Theodore, will get back with you as soon as possible. Strike Lightning would also encourage bikers to submit a review of the 2004 Honda CRF50 Street Legal Dirt Bike for Sale to help potential buyers make informed decisions and to benefit the biker community as a whole. The Honda dirt bike for sale is located in Granada Hills California and the asking price is $2,650 or reasonable offer.